FDI inflows reached a new high in 2007 in the CEEC region as a whole. Within the region, the shift of new investments to the East continued: a decline or at best stagnation was recorded in the NMS, modest growth in Southeast Europe, and a boom in the CIS. For the first time, the four European CIS countries received more FDI than the NMS-10, which was mainly due to the continuing investment boom in Russia. In the NMS the stock of FDI is shifting from manufacturing to services, first of all to real estate and other business activities. 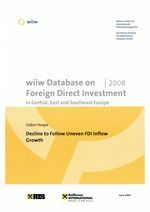 The current account impact of FDI in connection with the investment development path is investigated in a special section. FDI inflows to the CEECs will face a setback in 2008. This expectation is confirmed by preliminary first-quarter data. Lower FDI flows to CEECs have to do with the global financial turbulence, the declining rate of economic growth in Europe and also with home-made problems and cyclical events in some of the countries. The analysis is followed by two sets of tables: Tables I contain total flow and stock data according to the respective countries' National Banks while Tables II provide more detailed FDI data by economic activities and by countries. The main source of data are the National Banks of the individual Central, East and Southeast European countries. FDI flows are taken from the balance of payments, stocks from the international investment position statistics.